Summer is upon us and it’s time to kick it off by keeping you all up-to-date on the recent slew of updates we’ve released. You may not be aware, but we often make continued improvements to FeedPress—sometimes they are silent updates that make things faster or easier, but we don’t advertise them. On occasion, those updates are small features you’ve been asking for, but since we typically only post them on Twitter and Facebook, it can be easy to miss them. Today marks a change for us. Going forward, we’re going to do a changelog on a regular basis once we’ve committed a handful of changes that directly affect you, our lovely FeedPress customers. We’ve been busy bees and have been heads down working on a big release, which we aren’t ready to talk about yet, but without further ado, let’s get straight to our latest batch of updates. We launched podcast hosting in March of 2015 and could not be happier with the response received. Maxime and I are not known for resting on our laurels, so we have decided to increase available podcast storage from 250 MB to 400 MB. While 250 MB was enough for most people releasing 4 podcasts per month at low bitrates, we believe the extra storage will help those that wish to use higher bitrates. For example, I have no issue with hosting 4 podcasts per month at 192 Kbps MP3 (stereo). If you’re not familiar with how our hosting works, FeedPress provides 400 MB of storage that rotates monthly, so once you use up what’s given to you, the next month you have another 400 MB of new storage available to use. This is unmetered bandwidth, so you can rest assured that if your podcast suddenly becomes a hit, you won’t be shut down or throttled in any way. You can find hosting under Settings > Your Files. If you haven’t hosted with us yet, that’s okay. You can turn on a 14-trial to test it out! Securing RSS feeds is something we’ve been wanting to do for a while, and thankfully, Let’s Encrypt has come along to make this very easy for companies like us to provide free encrypted feeds. 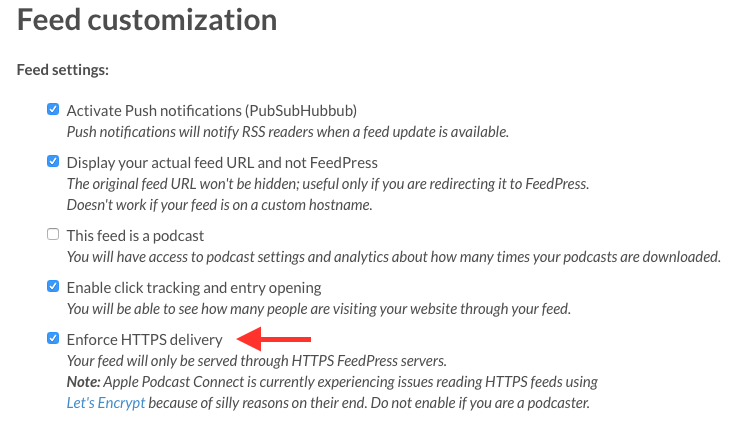 In your FeedPress account, you can optionally enable SSL on your blog or podcast feed. You can enable SSL by going to Settings > Your Feed. If you have a Custom Hostname enabled, you will need to go to go there to turn this on. For podcasters, please be aware that we do not recommend enabling SSL just yet–not until Apple fixes the iTunes Podcast Connect backend so that Let’s Encrypt enabled SSL certificates are recognized. This has been a long time coming, but we finally made a big switch from our old email provider to a new one: Mailjet. Mailjet provides an improved email deliverability track record as well as some interesting advanced analytics, which we plan to make available to FeedPress customers that use our newsletter feature. FeedPress offers social media publishing integration, including Facebook. If you’ve been using this, you may have been pestered to renew your Facebook token. This has been a bit of a frustration for some as Facebook, without explanation, can revoke any app token that’s been authorized with it. Effective immediately, we now take steps to try and auto renew your Facebook token so that you don’t have to. When this happens, when you login to FeedPress, you should be greeted with a notification that this has been done successfully. That’s all for now. We’ll see you at our next changelog update!